Following Volvo and Mercedes-Benz video tours of Apple’s newly announced in-car system dubbed CarPlay (formerly iOS in the Car), Apple’s third launch partner – the Italian sports car maker Ferrari – today showcased the technology at the Geneva Motor Show in Switzerland. Have a watch at Ferrari’s video below. Engadget got some hands-on time with the FF’s CarPlay and noted that the feature connects to the Ferrari’s built-in navigation system via a Lightning adapter located underneath the armrest. 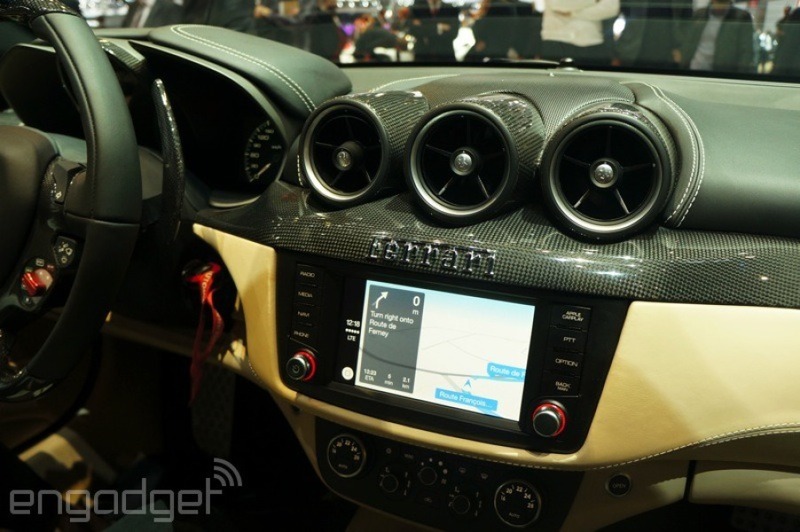 Once it’s connected, Ferrari will continue to utilize its own infotainment system, but users can load CarPlay by hitting a dedicated dashboard button, allowing all touch and voice inputs to be diverted to your iPhone. This loads the CarPlay dashboard, which features a familiar array of icons and services you’ll recognize from your iPhone. 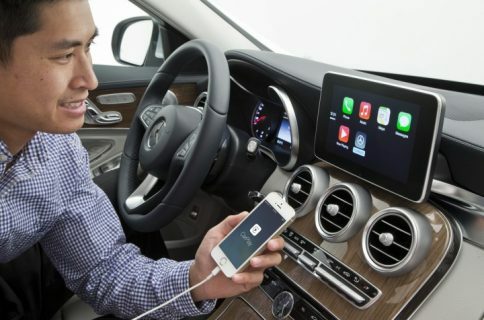 From here, it’s a case of using the touchscreen or calling upon Siri to load each of the services – the latter of which can be summoned with the Siri Eyes Free button located on the reverse of the steering wheel. Engadget was impressed with how speedy everything is. Apps load quickly, as per Engadget, and Siri’s contextual algorithms worked flawlessly. CarPlay is clever enough not to draw a driver’s attention away from the road so Siri reads back any incoming message though one doesn’t get to see its contents on the screen unless the Show Messages button is tapped. This feature was designed with driver safety in mind and is in line with Apple’s theme of advertising CarPlay as “a safer and more fun way to use iPhone in the car”. If you can’t see the video embed, check out this YouTube version. 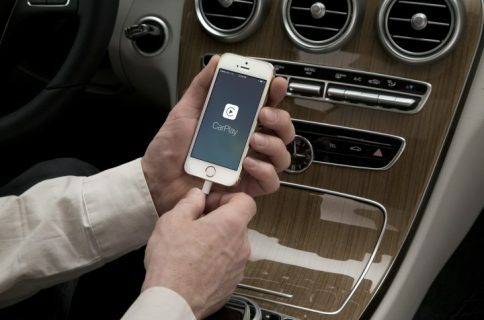 According to Volvo, wireless CarPlay connections are coming soon. 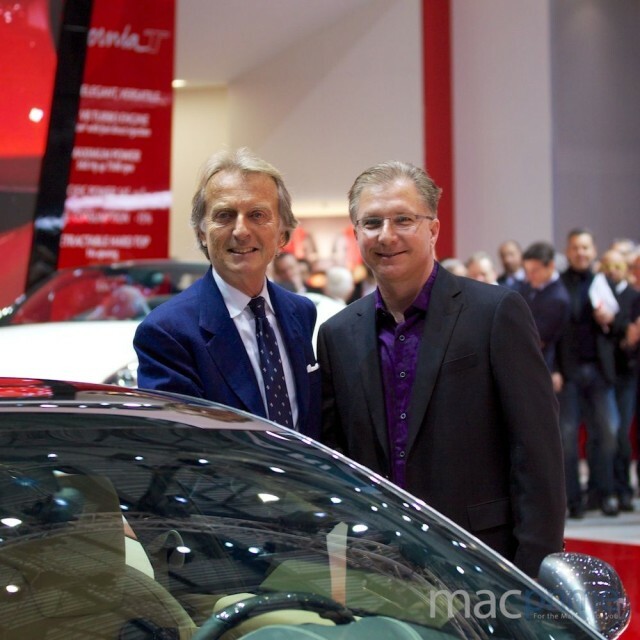 Check out Apple’s Greg Joswiak with Ferrari chairman Luca di Montezemolo. Image courtesy of the Swiss blog MacPrime.ch. 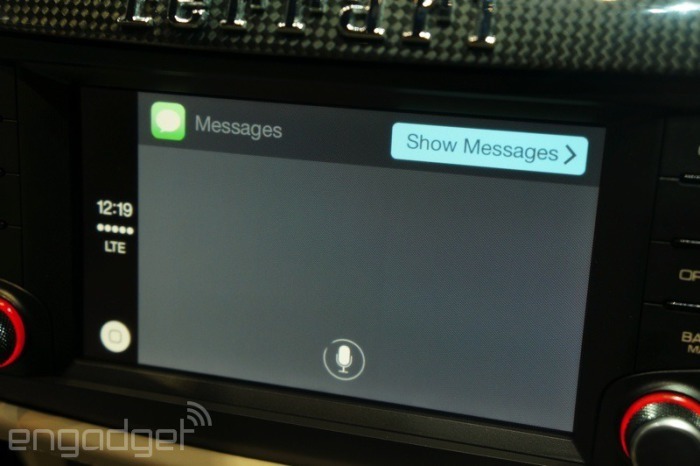 I am both proud and delighted to announce Ferrari’s collaboration with Apple on CarPlay. We are the first company in the world to offer its clients a car equipped with a system this advanced. It is the result of two years of working on absolutely the same wavelength with a young, extremely innovative company very much at the cutting-edge of technology. Ferrari will be “doing more good work” with Apple in the near future, including the upcoming California T model, he said. 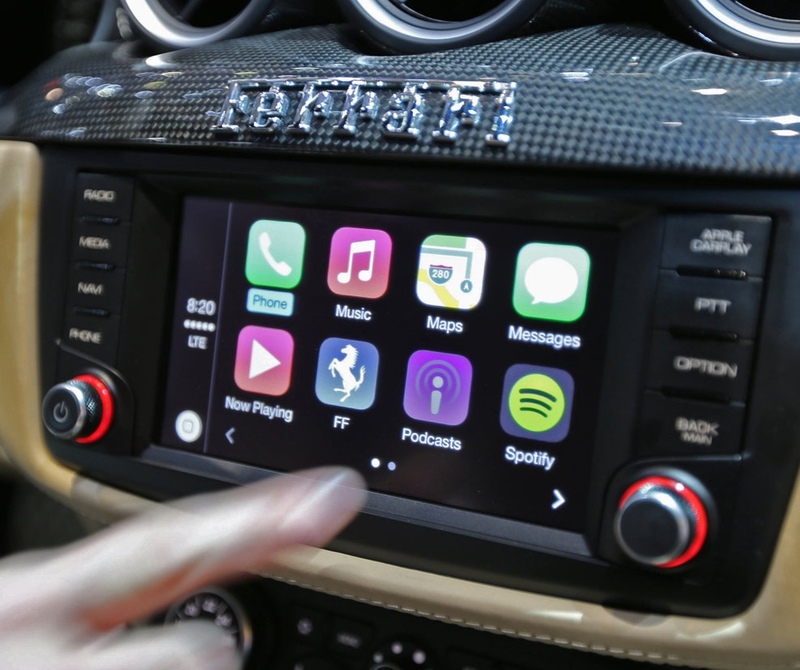 “A system like CarPlay, that allows you to safely use and enjoy your phone in the car and can also be controlled using just voice commands, has the innovative component that is so important to us,” said di Montezemolo. Engadget has also learned that apps with CarPlay support will automatically appear on the car’s console. Apple has restricted third-party CarPlay access to a select few music apps like Spotify and iHeartRadio, but not Pandora or Rdio. As for mapping services, CarPlay only supports Apple’s own Maps service which uses context awareness and artificial intelligence to predict where a driver may be heading, so he or she doesn’t even need to enter in an address for a final destination. The company has not said when – or if, for that matter – it intends to open up CarPlay to third-party app makers. According to BlackBerry, CarPlay uses its QNX software acting as a medium between CarPlay and the car’s embedded software. As for Ferrari, I’m finding it ridiculous they wouldn’t give the FF a nice capacitive touchscreen. Apple’s Internet Software and Services chief Eddy Cue has a seat on the Ferrari board so maybe the car maker should ask for his input the next time the manufacturer dares outfitting a $300,000 grand tourer with a sub-par touchscreen. Compared to Ferrari, Volvo has a lovely touchscreen. As for Mercedes-Benz, the touchscreen on its new C-Class inexplicably floats above the dashboard, as seen in the above shot. Why not just build it right into the console, like in Volvos and other vehicles?